Do you spend your days lounging at your country club in your tennis whites, sipping cocktails and gossiping loudly with your girlfriends about WHO Debra is seeing and how Jennifer is DEFINITELY sleeping with the pool boy? Us neither. 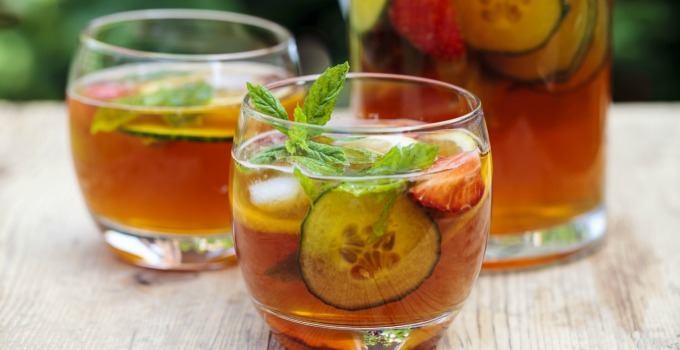 BUT, short of quitting our jobs to become full time tennis mums, it’s never going to happen so we’ve settled on the next best thing – drinking Pimms. It’s factually proven** to make you fancier just being near it – and the refreshing combination of Pimms, ginger ale, fresh fruit and ‘erbs makes it the ultimate summer sip. Check out our guide on where to find the best of Brisbane. The jewel of Given Terrace, Darling & Co. is the ideal place to while away a Saturday afternoon. With $15 carafes of Paddington Pimms as part of their Carafe-ternoon from 3-5pm, you’ll have plenty of spare change left over to order some pork katsu sliders with kewpie mayo and tonkatsu, or Mooloolaba tuna tacos to accompany it. They might be famous for their gincredible spirits selection, but Covent Garden have proven that their Pimms jugs back a punch! Relax in Brisbane’s prettiest gin garden and pair your Pimms sips with juniper smoked salmon, slow cooked lamb shoulder with panzanella salad or indulge in a decadent mezze platter with olives, baba ghanoush, feta and pickles. Whether you’re after a cheeky post-golf snack or a relaxing family dinner, Victoria Park Bistro has everything to revive you. Team your fresh-fruit laden Pimms jug with arancini balls and Korean style hot wings to nibble on – or feast on gamberi and tartufata pizzas fresh from the wood oven. Sittin’ and sippin’ by the Brisbane river sounds like a pretty mint time to us! Set within two huge shipping containers, the giant open-air beer garden is perfect for an afternoon of bites and boozing. Accompany your Pimms with morsels from revolving street kitchens including Carolina Kitchen, Taste of Africa and Kraut n’ About. Whether you’re a Pimms novice or a pro – there’s a jug with your name on it. ** We are not scientists. - the gourmand who knows anything that includes fruit is a health tonic.